RX-80-5 is R core audio output transformer for push-pull type amplifier. Excellent magnetic properties of R core as well as precisely wound construction of the coil by the computerized manufacturing system achieve the wide bandwidth, low distortion, and low magnetic loss of the transformer. Power handling capacity 80W, primary impedance 5,000 ohms, equipped with ultra-linear taps and cathode feedback winding, the best match for push-pull tube amplifier using 6CA7/EL34, 6L6, KT88, 300B, etc. High power, the low distortion , and the high dumping factor are obtained by the cathode feedback circuit. The combination of high performance core and generous turns of coil winding assures high primary inductance presenting good sound quality such as solidness of mid and low range. Precisely wound coil has no peculiar peaks and dips in attenuation characteristic and excellent response at high frequency, so enabling stable NFB operation and transparent sound quality. Perfect balance coil design realizes the low distortion factor even with non-NFB amplifier. Enclosed in a handy and beautiful square case. The same mounting dimensions as those of Tango XE60, FC-30. The case color is a black and silver. W: 4.33inch, D: 3.94inch, H: 5.91inch, Wt. : 6.6lbs. When using the cathode feed back winding, the connection of primary winding and cathode feedback winding is as follows. In the case of self-bias, a self-bias resistance and a bypass capacitor are connected between K1-Brown and a ground and between K2+ white and a ground. The load of the output tube is both the primary winding and cathode feedback winding in the cathode feedback circuit. The load impedance of the output tube is not 1.25K ohms of a usual pp circuit (1/4 of 5K ohms). The load impedance is as follows. The feedback factor β is a voltage ratio (a winding ratio) of load Rl and the cathode winding . Transformer cover case facilitates mounting on the amplifier chassis and brings superior looking to the amplifier. The same mounting dimensions as those of Tango XE60,FC-30. The beautifully finished case is four-side welded construction, black or silver painted. The first graph below shows the wide bandwidth 2.7Hz to 50KHz (-1db) and plain attenuation characteristic without any peculiar peaks and dips at the high frequency. The frequency characteristic of the audio output transformer varies with the signal source impedance that drives the transformer. In general, the bandwidth broadens in a lower signal source impedance. The bandwidth narrows in a higher signal source impedance. The figure below is the frequency response when it drives by 1.2K ohms signal source impedance like triode power tubes and when it drives by 20K ohms signal source impedance like beam power tubes. The primary inductance of the push-pull output transformer very much influences the low frequency response. This primary inductance varies according to the magnitude of the signal level and unbalanced DC current level. The more the primary inductance increases and the less it varies, the more solid and stable sound quality can be obtained. When the input signal level decreases, the permeability of the magnetic core also decreases, which inevitably results in the decrease of the primary inductance. On the contrary while the input signal level increases, the primary inductance also increases. When it reaches, however, to its maximum magnetic flux density, the core is saturated and then the primary inductance starts to drop. 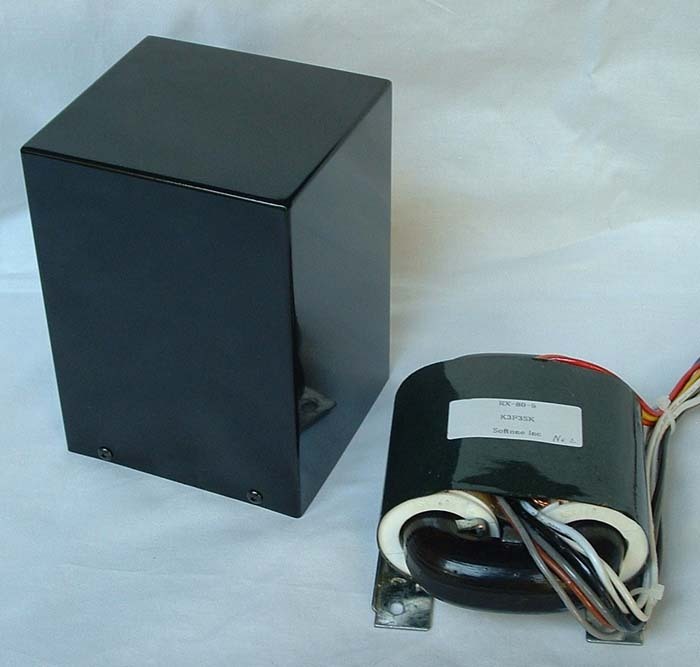 The output transformer equipped with good quality magnetic core assures higher value and less fluctuation of the primary inductance. In order for push-pull type output transformer to perform the best, the DC current difference between P1 and P2 windings (unbalanced DC current) should be minimized. For this reason, a matched pair of power tubes is used for push-pull amplifier. The graph below shows the primary inductance level caused to decrease by the existence of unbalanced DC current. The primary inductance of RX-80-5 audio output transformer is very large, being 120H at minimum and 860H at maximum. Furthermore, the fluctuation of the inductance is quite small assuring good total performance. However, the existence of the unbalanced DC current reduces drastically the primary inductance. Although the service limit of the unbalanced DC current is 6mA, we recommend reducing this unbalance down to 3mA or less in order to make maximum use of this R core output transformer.